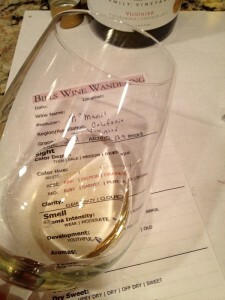 A week prior to Thanksgiving I read an article on serving Viognier with your Thanksgiving turkey. It got me thinking about what I wanted to serve for our meal. This Thanksgiving, all of our kids and their “significant” others were joining us for dinner at our home. Since most of the kids are at the legal age I wanted to share something that would be a little sweet, but not dry. Since we were doing our last minute shopping at the local Byerly’s I decided to check out what they had. At the store I had a difficult time locating the Viognier before eventually asking the cashier who escorted me to it’s location. There were four bottles and they were located on the bottom shelf in the Riesling section. Since the selection was very small it was pretty easy to to decide on which one to buy so I grabbed the 2011 McManis Viognier and headed to the checkout. 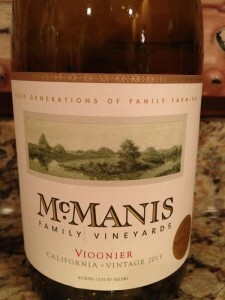 On the morning of Thanksgiving I decided to put the 2011 McManis Viognier in the refrigerator. I know the temperature would be to cool at first, but when it sat on the counter for thirty minutes it was pretty close to its serving temperature between 50° and 55° degrees. Chris was just about ready for everyone to come plate themselves so I grabbed a tasting sheet and I didn’t need a cork screw since it was screw top bottle. The color depth was very thin and clear as you would suspect. The color/hue was slightly green. The Viognier was very aromatic and seemed very young. Some of the aromas were lemon, Grapefruit, and Green Apple. The Viognier was very sweet and full bodied. The acidity was pretty good too (my mouth watered with every sip). There were no noticeable tannins but the wine was flavorful. Some of the flavors were Lemon and sweet citric fruits and the finish was medium in length. I rated the 2011 McManis Viognier three glasses. Some of the kids did like or said they thought that “it was OK”. I have to say if I would have opened a full bodied Cabernet Sauvignon they would not have liked it at all. So we are getting there slowly and making progress. I look forward to the moment they find that perfect wine that makes them fall in love with wine like I have. I hope you had a Happy Thanksgiving and holidays!